We started from Azafady’s Sainte Luce campsite shortly after dinner, under the slowly darkening sky. This evening we were heading to forest fragment S8, almost an hour’s walk away, to do a night transect looking for lemurs. Azafady’s Conservation Programme (ACP), carries out a number of these every month to monitor the lemur population, amongst other studies and tasks. As we walked along the road we talked about previous travels – many of the volunteers had previous experience in wildlife conservation, in places as varied as Botswana and Borneo. With us were two trainee ecotourism guides, learning from the experienced local guide, Solo, whilst also getting used to the kinds of questions visitors ask, and practicing their English. Azafady’s hope is that ecotourism will become more popular in Sainte Luce, providing an important income for the local community which also emphasises the value of the forest. After crossing a few large puddles we left the road, cutting across the plain to the start of the transect. These well-established paths head from one side of the fragment to the other in a more-or-less straight line, making them ideal for research work. As we entered the forest, the air became closer and humidity rose, as rainwater and earthy smells were trapped by the canopy above. 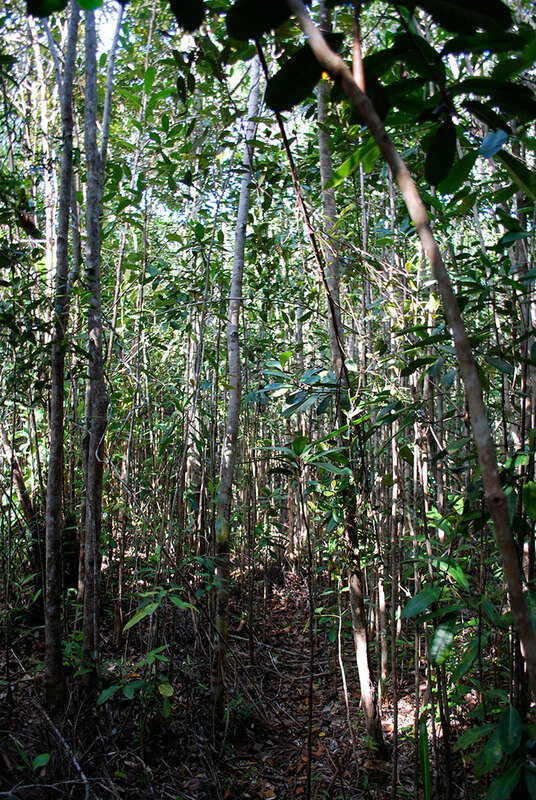 The forest at Sainte Luce is littoral, and very uncommon in Madagascar – just three areas remain in the whole country, and these are gradually diminishing. The foliage is dense, and with a low canopy – often just 10 metres from the floor – which creates an enclosed, almost claustrophobic feeling, and adds to the feeling of excitement and adventure as you walk through. Home to many species of palm, including the critically endangered species dipsys saintelucei and beccariophoenix madagascariensis, which Azafady monitor and attempt to preserve, there is an aesthetically-pleasing variety as you scan the treetops. Walking along the path in single file, we looked all around us for glimpses of fur or eye shine, necks craned to check the tops of trees, and bent downwards to check lower reaches for mouse lemurs. Various winged insects circled in the light of my head torch, and a large beetle droned in and settled on my nose. Daft thing. 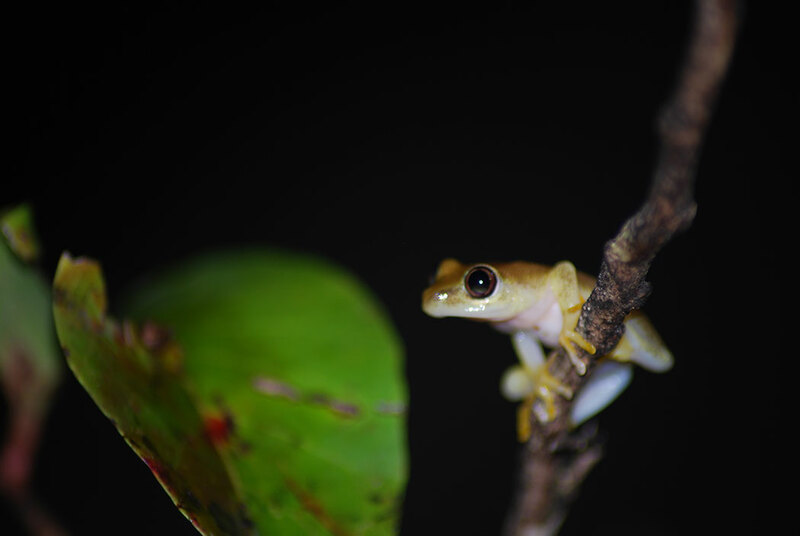 We briefly paused to check the path, so I quickly scanned the nearest tree-trunks for the elusive leaf-tailed gecko, hoping to see another of Madagascar’s enigmatic herp species. We passed dozens of spiders on intricate webs, many of them completely unknown – almost no research has yet been carried out on the arachnids of this area, even as the habitat dwindles. Twenty minutes in, we saw our first lemur – a fat-tailed dwarf lemur (cheirogaleus medius), a mere six metres from the path. The time, location, tree species, behaviour, canopy cover and many other details are recorded, for data analysis and further study later on. There was some minor mishap with the GPS, and a quote from John Cleese’s GPS voiceover sprang unbidden into my mind (Bear left, beaver right! ), aptly, as he is a great advocate of Madagascar’s wildlife, and even has a species of lemur named after him. Other celebrities to note the wonderful variety of life in Madagascar include Douglas Adams, a personal literary hero, who first visited in 1985. Walking on, the keen eyes of trainee guide Charlot soon pick out another fat-tail away to our left. As the Pioneers and ACP research assistant collected data, the other trainee, Javeni, related facts about the local lemur species in tentative phrases. 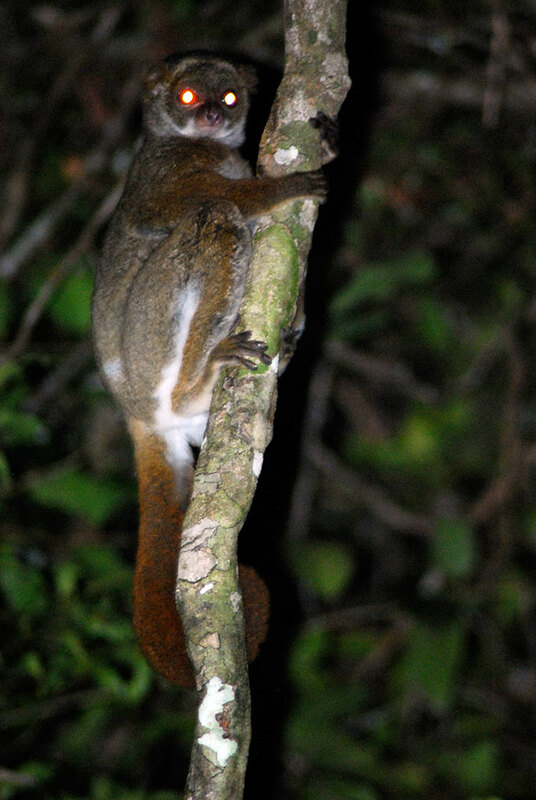 There are two species of dwarf lemur in the Sainte Luce area, the fat-tailed and the greater dwarf lemur. The fat-tailed is so named because it uses it’s tail to store fat in the summer months, before undergoing a sort of hibernation over winter, for up to 6 months. Both nocturnal, they eat leaves, fruit, flowers and seeds. Further on, we spotted a group of southern woolly lemurs (avahi meridionalis), including a mother and baby. Normally hopeless at seeing far-off lemurs even when they are pointed out to me, I’m able to catch this one quite easily as the beam of my torch reflects the green glint of their eyes. The southern woolly was only described as a species in 2006, and as of 2010 there was still no completed study of them in the field. There are two other species of lemur in the Sainte Luce area, the diurnal red-collared brown lemur and an unconfirmed variety of mouse lemur, which we had seen on a previous night walk. As we reached the edge of the forest, and the end of the task, two fireflies appeared from behind a fern, and spiralled up into the canopy, flickering green specks against the shadow of the trees. On the fringe of the forest were various stumps and blackened trunks – fragment S8 is partly community use, and this area had been cleared to plant cassava. Between the plants were patches of bare soil, some of it sandy and black – perhaps traces of ilmenite, the precious mineral found under all of Madagascar’s littoral forest, for which mining company QMM plans to dig up the majority to obtain. After a enchanting night like this, losing all this beauty seems a huge price to pay for an ingredient used to whiten toothpaste, of all things.